Square Enix takes the winning formula from Zynga's Mafia Wars and applies it to Final Fantasy to create Knights of the Crystals. Will you party up, or spend some quality time breeding chocobos in Chocobo's Crystal Tower? Yes, it's Final Fantasy: Mafia Wars, more or less. Players complete quests using action points, leveling up and increasing their stats so they can earn more action points and complete more quests. Quests earn players money, which can be spent on new equipment, which is required to complete certain quests. There's player-versus-player combat, with your mafia party members backing you up. First off there's a job class system, with different jobs unlocking as you progress through the game. So far I've unlocked Fighter and Healer. And then there are boss fights. 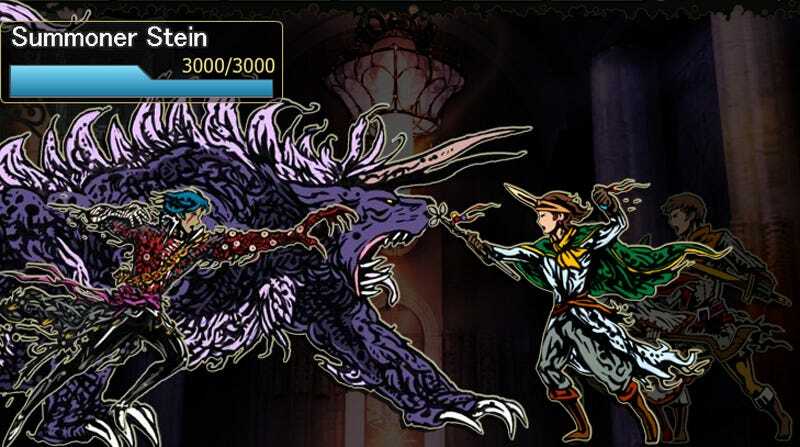 In a boss fight, you gather together a party of your friends (NPCs are available for the friendless) and fight massive creatures in turn-based battles. Special attacks and magic are available depending on the classes that make up your party. Knights of the Crystals is available now on Facebook, and I could really use your help. Should you partake, send a friend request to Fahey@Kotaku.com, and maybe I can stop logging into an endless string of "You lost the fight..." messages. And for those of you with a more peaceful disposition, there's Chocobo's Crystal Tower, a game about breeding chocobos, dressing them up, and sending them off to die in battle. Fun! Thanks to Sephirosuy for pointing these out!